The bold, smoky, and earthy Chipotle peppers are now packed in this A.1. Sauce bottle! With just the right amount of pepper this sauce can give your food the spice you've always wanted! Combination of other exotic spices and tomatoes give you the oh-so-familiar Mexican kick. The sweet aftertaste soothes your burning mouth and prepares you for more!Spice lovers, Get Excited!A.1. Sauce picks only the spiciest peppers of them all! Just the ones spicy enough to knock your socks off! But then also skillfully balances it with the sweet factor of the sauce, so you could have more without needing to stop. 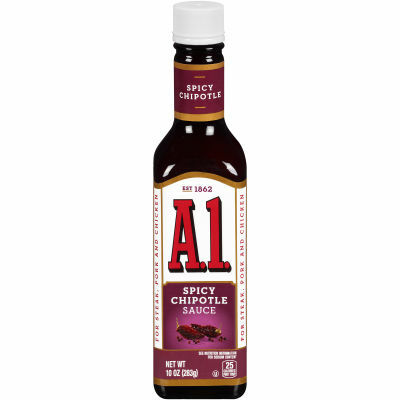 Spice Up The Evening with A.1. Spicy Chipotle SauceSpicy Chicken, Spicy Pork, Spicy Steak, Rock them all! Family, friends, neighbors, call them all! Have a fiery feast at your home.